May the Magic of the Stage Be With You! The bell rang. Enzo gave his parents a quick hug and ran to take his place in the line. There was no doubt that this was to be the best day of his life: at last he was going to secondary school and, what was far better, to the Leonardi School of Dramatic Art. What Enzo had always dreamed of. His teacher, a man aged about thirty, came up to the line and motioned to the pupils to follow him. Soon the first years stopped in front of a large door, similar to the doors in cinema studios with the same red light and illuminated “On Stage” sign. When both lights went out, they entered. The theatre was quite magnificent. Gold everywhere, velvet seats and, of course, an amazing stage. Enzo’s mouth was wide open with admiration and excitement. When all the pupils had sat down, the director appeared. He was a solidly built man in an impeccable gray suit. All the pupils took up the school motto in unison and applauded. Enzo’s heart was beating, fit to burst. Gradually the theatre emptied and the first years again followed their teacher to a studio door. The pupils went in and sat down in theatre seats facing a small stage plunged in darkness. Their teacher, standing on the stage, finally began to speak. He took his list and called out the first two names: Enzo Andel and Lucie Argo. The two pupils stood up and made their way to the stage. Enzo felt a little intimidated. He loved making up stories, pretending to be a hero, having fabulous adventures, but acting them out in front of an audience was different. Lucie came up to him and they began to discuss their theme in whispers. After one minute’s consultation, they had reached an agreement. They climbed up onto the stage, Lucie took a chair from the wings and they began. Enzo went up to what was supposed to be a throne, with the dragging gait he imagined appropriate for a fat, bearded dwarf, while Lucie drew herself up to acquire the presence befitting the queen of the elves. But as Enzo was preparing to speak, he felt all the muscles in his body slowly contracting and shrinking and then gradually increasingly filling out. His chest swelled, his hair and a bushy beard sprouted all at once, his clothes became heavier and he soon found himself transformed into a real dwarf. He turned with staring eyes towards his partner. She too had been transformed. Her hair was now blonde and straight, her ears were strangely longer, she was wearing a magnificent silver coronet and the chair she had been sitting on was now a majestic throne carved from a tree trunk. The scenery had also changed. It was no longer a small theatre; it was a tree, a huge tree where countless elves were going about their business. The teacher’s voice came to them from a great distance, like an echo. Then, without thinking, Enzo began to perform. He introduced himself as Elgrom, the ambassador of the dwarves, who had come to give a present to Lindorië, the queen of the high elves. Lucie, slightly stunned, let herself be swept up too. She thanked him and invited him to join her for dinner. When they were sitting at a table that had appeared as if by magic, Enzo took a little box, which was hanging from his belt, and handed it to Lucie. 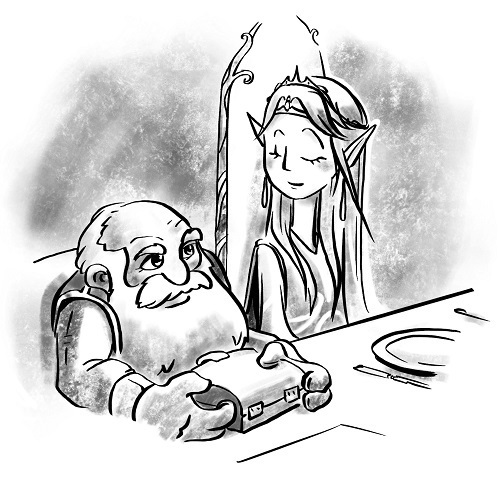 She opened it and found a glittering diamond necklace made, according to Elgrom, by the best jewellers of the dwarf kingdom. Lucie tried it on, but when the cold metal touched her skin, she fainted. The necklace was poisoned; it was a trap. Enzo was panic-stricken. He was suddenly surrounded by thousands of archers, all aiming their arrows at him. He stammered that he didn’t understand, that he... Two elves were leaning over Lucie. Enzo was about to go up to her to see if she was alright when he was struck by an arrow right through his heart. He screamed with the sharp pain and collapsed on the floor. When he opened his eyes, he was an eleven-year-old child again in a theatre and all the pupils were applauding. This year promised to be very different and a lot more dangerous than he had imagined.